What’s a Monty Python reunion without a dead parrot? And why settle for a simple prop you can bang on the counter when you could have a monstrous, 50-foot-tall dead parrot? 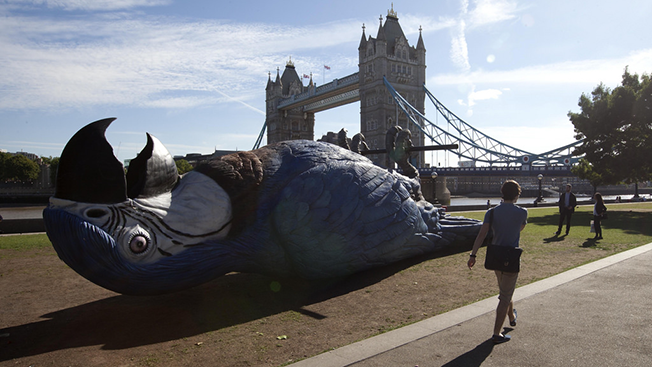 To promote the live broadcast of the comedy troupe’s July 20 performance, UKTV’s Gold channel and sculptor Iain Prendergast created a massive fiberglass dead parrot, which was suspended from a crane and laid talons-up in London’s Potters Field this week. The bird is, of course, a reference to Monty Python’s enduring “Dead Parrot Sketch,” which you can watch below. Instead of being unfriended because you’re trying to convince people to change their vote, share your opinions on things that really matter, such as which website contributes most to time suckage (Twitter, Reddit, Pinterest), the video game forcing you to reclaim your life, your favorite app and other assortments of digital entertainment. Adweek’s annual Hot List where consumers voted primarily on favorite print ads and magazines in order to get metrics on ad dollars, was born 32 years ago. But it today’s digital world, the Hot List has been upgraded to include a digital media section so consumers are now asked to vote on innovations such as iPad developments, pop culture websites and new cell phone apps. By adding digital selections Adweek made this year’s Hot List Reader Poll categories more relevant and fun while giving an opportunity for trendy digital connoisseurs to learn about something new. The polls are open, and results will be online and in print December 3.